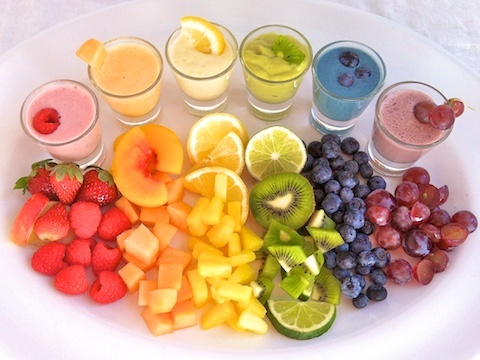 Taste the rainbow, I say. And I sure am not talking about Skittles here. Y’all thought I was gonna feed y’all candy? Nope. Nor do I mean a literal rainbow (good luck). 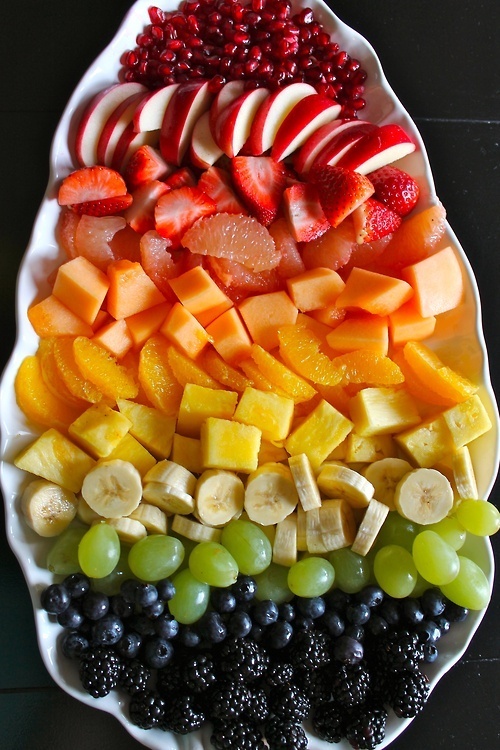 When it comes to slowing down the aging process, it’s good to seek out different antioxidants in different fruits and vegetables, so fill your cornucopia with fruits of each of the color wheel`s colours. See red. Roses are red, violets are blue, beneficial antioxidants are found in produce with a reddish hue (my career as a poet is just taking off here 🙂 ). Strawberries, raspberries, cherries, red grapes, watermelon, cranberries, tomatoes, red peppers, and beets contain anthocyanins which may help reduce the risk of heart disease and stroke by inhibiting clot formation. Many reddish fruits also contain lycopene which protects your skin against the sun’s damaging UVA/UVB rays and against prostate cancer for those of you that have a prostate. Gravitate towards yellow and orange. Fruits and veg that are this sunny hue like butternut squash, spagetthi squash, cantaloupes, carrots, oranges, peaches pumpkins, orange and yellow peppers, nectarines, and sweet potatoes contain vitamin A, which helps organs remain healthy and prevents bacteria from growing. Vitamin A helps prevent cancer, heart disease, reduce inflammation as well as high blood pressure. Orange produce is also a source of lutein, the main carotenoid of the human retina. Bananas are also chock-full of nutrients. Green is the new black. Green and yellow foods such as kiwi, corn, bok choy, spinach and avacado, contain lutein and zeaxanthin, which protect your peepers (jeepers creepers where’d you get those eyes?). As if that wasn’t sufficient, green foods, such as broccoli and brussell sprouts, contain isothiocyanates (another word to add to your repertoire), which induce liver enzyme production which help the body remove potential carcinogens from it (thus are anti-cancer). Asparagus, brocoli and spinach are sources of folate, which helps for cell reproduction. Green tea deserves a very honorable mention for its high amount of catechins, antioxidants that may also contribute to cancer prevention. The natural plant pigment chlorophyll colors green fruits and vegetables. Cholorophyll acts to neutralize blood pH. Blue to the rescue. The only blue fruit I can think of is blueberries, which is the king of antioxidants (their blood is blue?). Blueberries are one of nature’s most powerful antioxidants. Brown. Dark chocolate. The. rumors. are. true. Dark chocolate (containing 70% cocoa or more) contains antioxidants. Say yes to white. I’m aware white isn’t really a colour but…. White cauliflower, rutabaga and parsnips contain vitamin C, K, and folic acid. Don’t forget onions and garlic, which have a component called allicin which seems to protect our hearts and blood vessels from damage as well as fight tumors.